There is no such thing as too late, there is only now. Starting a business can be a scary thought for many. Excuses such as “it’s too late” or “no money” are just simply that… excuses. The truth is that you’ve been lying to yourself. No matter where you are in life, you can always start anew. And everyone’s story will always be different. J.K. Rowling, the author of the Harry Potter novels, was a single mom on welfare when she wrote her first novel. Arianna Huffington began Huffington Post at the age of 54; and Harrison Ford was a carpenter well into his 30s. If you are reading this article, you’re ready. Take action and start your business. You can’t have success if you don’t try. The road to success is a windy one. What better time to start. Break complications down step by step. If it takes three months to complete a big project – that’s four projects you can do a year. If you’ve got thirty years left of life, then that’s 120 tries at success! The Internet makes it easier than ever to start a business. Social media and our product team at Yola have made building and growing a business super easy. If you can post a status on Facebook, you can start a business. Tell your friends and everyone else you know and direct them to your website. Decide how much you want to spend on your website. If you don’t have a lot of cash flow for your venture, fortunately building a website with Yola is easy and also free. If you already have a website, you’re one step ahead and can still subscribe to our blog for helpful advice on running and growing a small business. You have more knowledge and experience today than before. No matter what experiences or profession you’ve had previously, you can change and grow. Mary Kay Ash, founder of Mary Kay, sold books door-to-door until 45 and Finance Guru Suze Orman was a waitress until she was 30. The experiences these people developed in their lifetime help them prepare for their ventures. Success is a state of mind. You have the choice to be positive and keep moving forward. Now is the time. Little by little you can grow your business online and start today. Have an idea for a small business but are unsure where to begin? Let us know your thoughts in the comments below, our advisors are happy to help answer any questions you have about taking your business online. 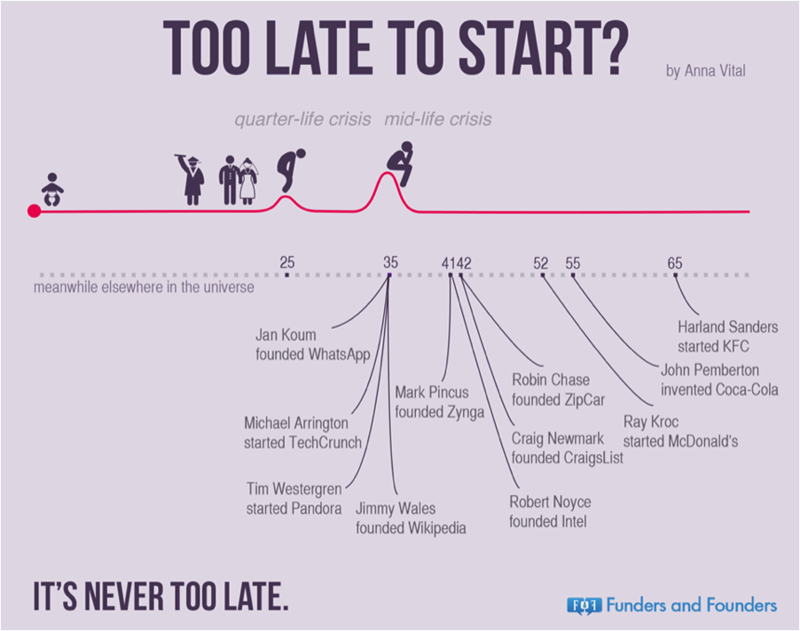 I wholeheartedly agree.there really isn’t a bad time to start.